Question: What color will my baby’s eyes be? If you and your partner both have blue eyes, are you guaranteed a blue-eyed baby? Perhaps you have brown eyes and your partner's eyes are green... will your baby's eyes be hazel? New parents often gaze into their baby’s eyes with wonder and amazement, and think... will my baby’s eyes stay this color? What color will my baby's eyes turn out to be? Most babies are born with blue or gray eyes, but depending on the color of your eyes and your partner's eyes, they may or may not remain their birth color. Your eyes get their color from the iris. The iris is made up of muscle, blood vessels and pigment. The pigment that is contained in the iris is called melanin. Melanin is also the pigment that your body produces to give your skin and hair their color. The amount of (or lack of) melanin pigment in your iris gives it its color. The more melanin pigment your iris has, the darker brown your eye is. The less melanin pigment, the lighter blue your iris is. So it is not a different color of pigment, but the amount that gives you a certain eye color. In a newborn baby's eyes, the pigmentation process of the iris is not yet complete. Babies with darker skin are usually born with dark eyes that stay relatively dark. Iris color in lighter-skinned babies is usually a blue or bluish-gray color at birth, then slowly changes. Melanin production changes during the first year of life, usually resulting in a darker, deeper eye color. It is thought that just as our skin begins to darken when exposed to sunlight, so does the iris. Sunlight may spur the production of melanin, so as you venture out into the real world, your eye color begins to change. If your baby has just a tiny amount of melanin, he will have bright blue eyes. If just a little more melanin is present, he may have gray, green or hazel. If he has even more melanin, his eyes might be light to very dark brown. Although light has an impact on eye color, the final color is most likely controlled by genes that we inherit from our parents. Permanent eye color is not set until a baby is at least nine months old, so wait until your child's first birthday to determine her eye color. Some children even have changes up to about two or three years of age. About 10% of people continue to have eye color changes as they grow into adults. Surf the web and you will find several online eye color calculators. Although most of them may come close to what eye color your baby might have, one problem you’ll see is that many of us don’t just have brown or blue eyes. Your eyes may be a mixture of blue-green with a hint of brown. Does that count as green, blue or brown? Simply using a calculator may not work. In some families, eye color inheritance follows very predictable patterns whereas in other families, it doesn't seem to make sense or follow any rules. In genetics, this is termed "polygenic." Polygenic means that there may be several complicated genes involved that interact to create eye color. Just stating that brown may be dominant to blue does make for easy explanations, but this model is too simplistic for all of the variations seen in real life. 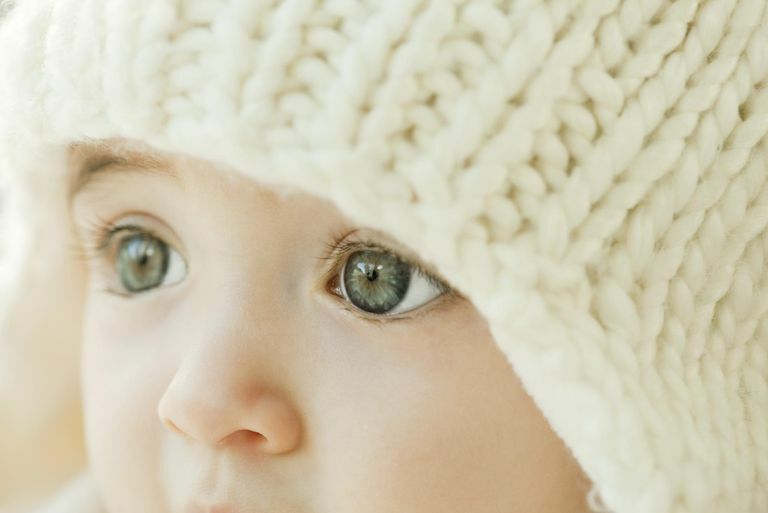 Don’t be discouraged if genetics predict a change in your baby’s eye color. The simple dominant and recessive genetics that most of us learned in school can still come close in predicting your baby’s eye color. For example, if you and your partner’s eyes are brown, but one of you had a parent that has blue eyes, there is still a small chance that your baby’s eyes will stay blue. If you have blues and your partner has brown, then your baby’s eyes have a 50% chance of either one. If both you and your partner have blue eyes, then your baby’s eyes will most likely not change and remain that sparkling baby blue! Mats, Richard A and Larsson Sturm. Cell Melanoma, "Genetics of human iris colour and patterns." Melanogenix Group, Institute for Molecular Bioscience, The University of Queensland, Brisbane, Australia, pp 544–562.